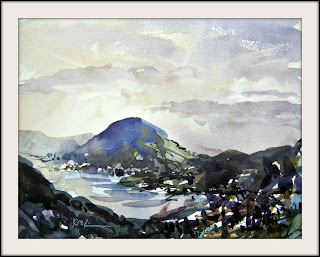 RoyTheArtist and Friends: Derwent Valley Morning, watercolor. Sometimes things go wrong, usually because I am trying to be an Artist instead of allowing the watercolor to speak. I did 2 studies and a failed landscape in that way, then just put up a blank sheet, drew breath, and painted this one in 20 minutes, It i,s (I feel) more successful because It was not laboured upon.